Villefranche-sur-Mer is a charming small resort to the west of Nice and Cannes and to the east of Monte Carlo. So it's in pretty distinguished company. But Villefrance-sur-Mer is surprisingly quiet and relatively undiscovered, with a delightful local feel to it. 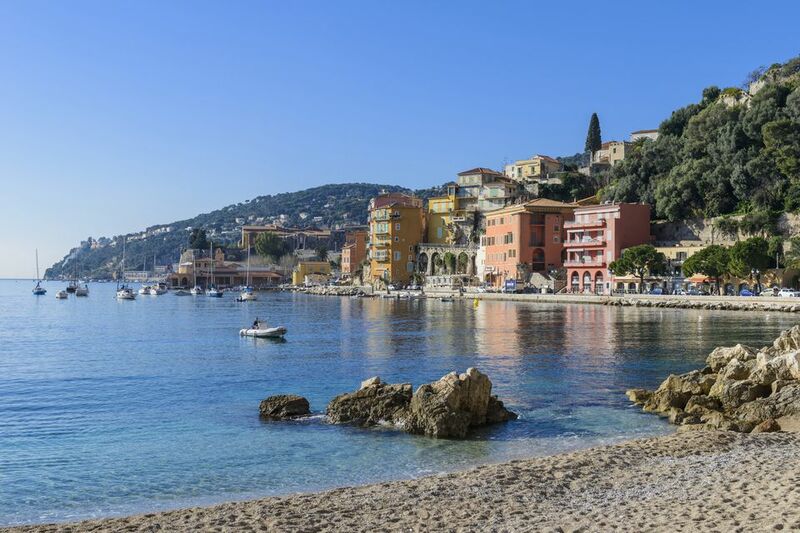 With a sandy shore, small village and relaxed atmosphere, Villefranche-sur-Mer is a lovely escape from the bustle of the bigger Côte d'Azur cities mere minutes away. Villefranche sur Mer is literally just five minutes from Nice. If you are relying on public transportation, probably the easiest way is to hop a train from Nice in the direction of Monaco/Ventimiglia. Before you get comfortable in your seat, it will stop at Villefranche-sur-Mer. There is also a local bus line that runs this route. The Old Town is just a short walk from the beach and the colourful port, and makes for a wonderful afternoon of aimless wandering, shopping, enjoying a leisurely lunch or sitting in a cafe watching the world go by. Walk the Old Town. Make your way up the rue du Poilu past small streets leading off to the right and left. Explore the strange, rue Obscure built on 13th century foundations that once ranged along the old medieval walls, its partially vaulted section protecting the citizens from bombardments from the sea. Now a National Monument, it was painted by the local resident, Jean Cocteau. Drop into the Baroque church of St Michel at 5 rue-de-Brès built in the 1700s in the heart of the old town. It has a 16th-century painted wood statues of Satin Roch and his dog, a recumbant Christ, and 18th-century organs built by the Grinda brothers in 1790. Baroque organs are rare today; these are designated as a National Monument. The 16th-century Saint Elme Citadel built in 1557 to protect the city and the harbour is testimony to the former importance of Villefranche. Today it houses the town's small museums where you can while away a happy hour or two. The Musée Goetz-Boumeester is the largest, housed in the old military barracks buildings where works by Christing Boumeester and Henri Goetz are displayed along with works by some of the great artists who the couple knew: Picasso, Picabia, Miro and Hartung. The Roux Collection is a charming collection of old figurines depicting everyday characters from the Middle Ages and the Renaissance. This is the best known building in Villefranche-sur-Mer, decorated by Jean Cocteau in 1957. Cocteau (1889-1963), the French writer, designer, playwright, artist and filmmaker who was part of the Parisian avant-garde between the wars, discovered the little town in 1924. The paintings of St Peter and of local women are pretty impressive, and unusual. It's well worth the visit. Open Winter daily 10am-noon and 2-6pm, and summer 10am-noon and 3 to 7pm. Admission €3. Originally dating from 1550, the natural harbour was important as the major military defensive port in this part of the Mediterranean. It became a royal port in 1713, expanding to include a dry dock for the purpose of building large galleys, a lighthouse a rope factory (La Corderie) and a hospital. Finally, chill out on the small beach which never fills up as the beaches nearby do in the high season. You can get a coffee and an ice cream nearby and sit looking out over the sparkling waters of the bay. Welcome Hotel, 3 Quai de l'Amiral Courbet, 00 33 (0)4 93 76 27 62, looks out over the harbour with good size rooms, all with sea views and balconies. Read reviews, check prices and book with TripAdvisor. Hotel Patricia, 310 Avenue de l'Ange Gardien, 00 33 (0)4 93 01 06 70 is near the railway line but is a delightful Provencal building with sea views. Read reviews, check prices and book with TripAdvisor. Le Riviera Hotel, 2 av. Albert 1er, 00 33 9(0)4 93 76 62 76 is a good budget option, simply, but prettily decorated. Book a room with a sea view. Read reviews, check prices and book with TripAdvisor. Villefranche sur Mer also makes a great central base for day trips to numerous nearby attractions. Nice, the Queen of the Riviera is a must for its glamour, history, its top museums once home to Impressionist artists, restaurants, shopping and superb market. Antibes is another favourite Mediterranean town, easy to reach by train. Check out the marina with its multi-million dollar yachts, its beaches, old town, Picasso Museum and restaurants. Saint-Paul-de-Vence is one of the prettiest hilltop villages along the coast, beloved of former French stars and near the top Maeght Foundation Museum and Art Gallery set in shady woods. If you have transport, don't miss the Villa Ephrussi in St Jean Cap Ferrat. It has spectacular interiors and gorgeous gardens and a view that will take your breath away.